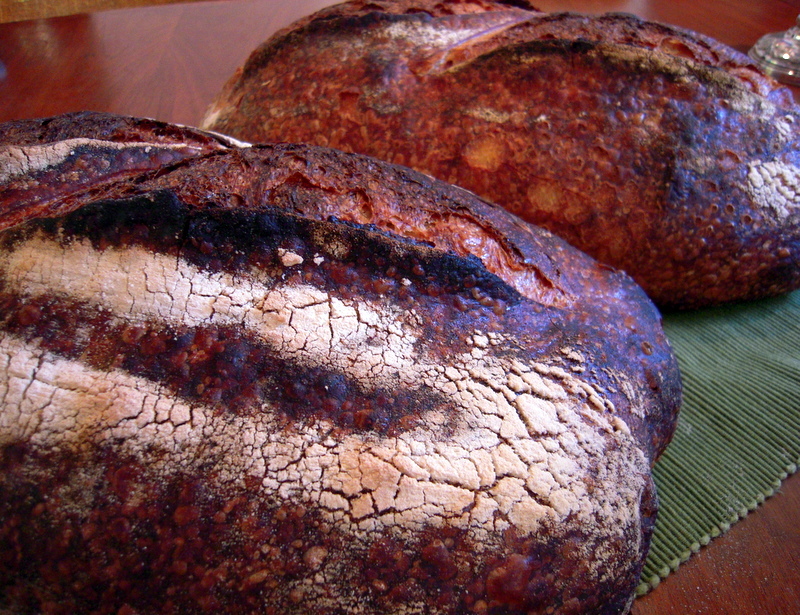 This entry was posted in book reviews and tagged chad robertson, tartine bread. Bookmark the permalink. After teaching my husband to bake his own pretzels (he was really blowing through them and making them got old fast) I found him the no-knead bread recipe in the Mother Earth News one day at the library. He went home and researched it further, and has been making our bread ever since- leaving it in a tub on top of the fridge overnight, and baking it in our cast iron Dutch oven. We haven’t managed a natural leaven, though. Maybe this book would make a great present for the end of the year. I mean, if he can buy me self-serving gifts, why can’t I return the favor? I love how-to books anyway- they make up the bulk of my library. BTW, I think it’s notable that you guys include dumpster-diving in your night out on the town. You’re not fattening a pig again, are you? Interesting. I thought the Tartine bakery was helmed by a woman. Liz Prueitt? I have a recipe for scones that apparently comes from Tartine, and I’ve got to tell you, they are the. best. scones. ever. I do miss bay area breads. World class bakeries are a dime a dozen out there. No place like it that I’ve ever been to. The sticky wet dough in a sealed baking container is the basic method for no-knead bread. If you haven’t tried that I recommend it. You’re not doing a drawing for this book then, I take it. Drats. On to my list it goes. Thanks for the recommendation. no pigs, thank god, just greens-loving rabbits and chickens. and billy enjoys pears. I know, ’cause I too am a unrepentant forager. And yes this is the best way to make chewy , tasty bread with a MINIMUM of effort. Yeah! cast iron! I love this review, Novella! I was already excited about the book, but now, having read your impressions, I really want it – thanks to you! I need another cookbook like I need a hole in my head, but I cannot resist after this review. I love baking bread and homemade pretzels sound delightful too. I just (like literally 10 minutes ago) finished Farm City and had to find your blog right away. I’ve promised myself that I need to start filling up my freshly constructed raised beds (pictures up tomorrow) with sheet composting materials before I can spend any time online, but I’m so glad to find you here. Thank you SO MUCH for posting about this book! I didn’t know about it at all. My bf has the Tartine pastries book, which he absolutely loves and makes so many things out of. He used to bake a lot of bread but hasn’t as much lately. I immediately ordered two bread book copies – one for him, and one for my brother. My bf has been soul-searching in the way of farming for a living (especially in the biodynamic vein), and when I received my brother’s copy in the mail, I was delighted to read about the author’s experiences in the largely biodynamic farm communities in Northern California and his amazing account on his quest to find his dream loaf. I think this will really help my bf re-connect with his love for good food during his farm career quest. Thank you so much, again! Unrelated, have you ever thought of raising guinea hens? Seeing an invasion of harlequin beetles in my front yard (or I think that’s what they are?? Homegrownevolution made a post about them but I can’t seem to find it) makes me wish I had a flock of them.. chickens seem more interested in grubs than beetle bugs. I love Green Apple. And B*Star and The Plough and the Stars down the street (best pint of Guinness around, and good folk dancing on Thursdays). I hadn’t considered the dumpster…sounds like a good plan for when/if I have some free bookshelf space.